Pour 2 Tbsp. dressing over steak in shallow dish; turn to coat both sides of steak. Let stand 10 min. to marinate. Meanwhile, heat remaining dressing in large skillet on medium-high heat. Add onions; cook 3 min., stirring frequently. Add peppers; cook and stir 5 min. or until vegetables are crisp-tender. Remove steak from marinade; discard marinade. Grill steak 5 min on each side or until medium doneness (160ºF). Remove from barbecue; let stand 5 min. before cutting across the grain into thin slices. Fill buns with meat, vegetables and lettuce; top with cheese. Flank steak comes from the animal's hindquarters. 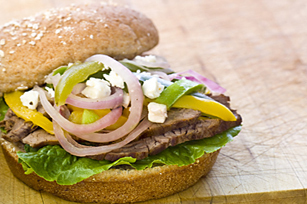 Flank steak benefits from marinating up to 24 hours to tenderize the meat. Flank steak is usually cooked in a large piece, then cut against the grain into thin slices. Enjoy the flavour of Greek cuisine with this tasty meal. As a bonus, the yellow peppers provide an excellent source of vitamin C.